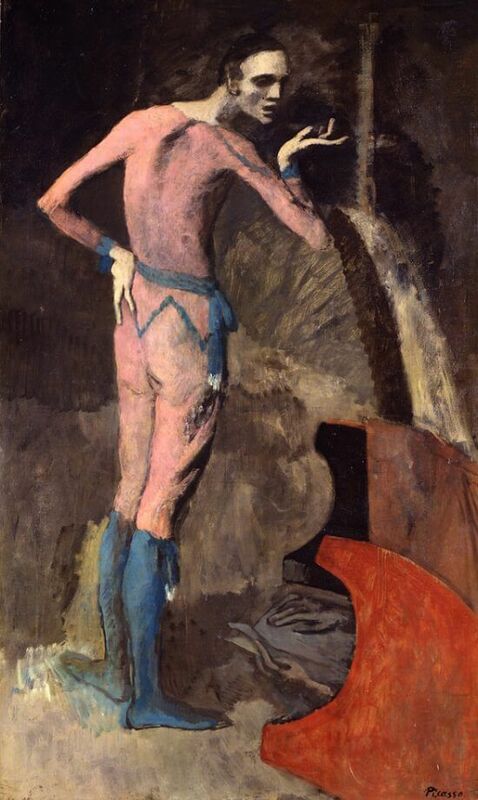 Simple but haunting, The Actor is the work with which Picasso ended his obsession with the wretched in favor of dramatic universe of trapeze artists and saltimbanques. In spite of the attenuated figure and extraordinary play of hands recall the El Greco inspired mannerism of the Blue Period, The Actor can be seen as the prologue to the series of works that culminates in the enormous canvas Family of Saltimbanques. A sheet of studies of The Actor, which was made around New Year's Eve 1904, includes two figures of Fernande and shows the same revision to the position of the performing artist's left leg and foot that is noticeable in the artwork. The new subject matter, palette, and sensibility of this picture coincide with the arrival of Picasso's new lover, the model and sometime artist Fernande Olivier (1881-1966). Another intesting point of this painting is that Picasso painted The Actor on the back of a previously used canvas, which is an landscape painting with swirling water by an unidentified artist.